H.H. Sheikh Hamdan bin Mohammed bin Rashid Al Maktoum, Crown Prince of Dubai and Chairman of Dubai Executive Council has stated that Dubaiís rising global rankings in a range of economic indicators show that it is closing the gap with the worldís most competitive economies according to the vision of His Highness Sheikh Mohammed bin Rashid Al Maktoum, the Vice President, Prime Minister and Ruler of Dubai, and in pursuance of His Highness's directives to achieve top positions in various sectors. H.H. Sheikh Hamdan added that Dubai's achievements in global competitiveness, especially in the ëEconomic Performanceí Pillar, have been driven by the fruitful development strategy it has adopted over the last few decades, and a genuine public-private sector partnership. He expressed his appreciation for the varied economic sectors and activities, and all those working in the UAE, citizens and residents, for their efforts in enhancing Dubaiís position among advanced economies and for its high global ranking across many indicators. "Dubai is an icon among the fastest growing economies in the region, and the world. Today, Dubai represents a unique experience of ambitious people and a pioneering government," he said, stressing that the private sector is "our strategic partner in achieving the future we aspire." Dubai ranks first in the Arab world and fourth worldwide in ëEconomic Performanceí Pillar, ahead of Canada, Japan, Singapore and Hong Kong, and all EU countries (excluding Luxembourg), according to the ëDubai Competitiveness Report 2018í issued by the Switzerland-based IMD World Competitiveness Centre in co-operation with the Dubai Competitiveness Office of the Department of Economic Development (DED). Dubai ranks first globally in both ëGross Domestic Savingsí (% of GDP) and íEmployment Growthí, and second in ëExports of Goodsí (% of GDP), low ëUnemployment Rateí and ëYouth Unemployment.í Dubai also ranks third globally in ëEmployment (%),í ëExchange Rates,í ëExport Concentration by Partner,í and ëExports of Goods Per Capitaí in addition to being fourth in terms of both ëGDP Per Capitaí (by purchasing power parity ñ PPP) and ëTourism Receiptsí (% of GDP). 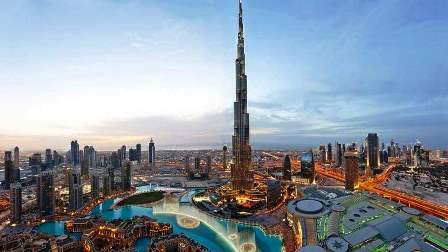 Within the Arab world, Dubai leads on several indicators such as ëDirect Investment Flows Inward,í ëForecast Inflation,í ëGovernment Consumption ExpenditureñReal Growthí, ëExport Concentration by Partner,í and ëTourism Receiptsí. The achievements in the field of global competitiveness are a compass to determine positions on the global economic map as well as identify strengths and weaknesses. Thus, the Dubai government is looking at competitiveness as a lifestyle and an approach towards sustainability in an ever-changing international environment. The ëDubai Competitiveness Report 2018í ranks Dubai the first globally in ëEmployment Growthí rate and 20th in ëEmployment in the Public Sectorí. Dubai is also ranked second in [low] ëUnemploymentí rate globally especially among the youth. This is due to the efforts exerted by the Ministry of Human Resources and Emiratisation and various stakeholders in enhancing flexibility of the labour market. The report shows that Dubai ranked first among Arab countries and ninth globally in ëDirect Investment Flows Inwardí (6.42% of GDP) with a stock of $73.8 billion, ahead of the US, Australia, Canada, Germany, France and China. The emirate also ranked second in the Arab world and 12th globally in ëForeign Direct Investment Abroadí (4.51% of GDP) with a total stock of $28.8 billion. Dubai developed not because of hydrocarbons; oil and gas now account for less than two percent of Dubaiís GDP, around half of its share in the 1980s. Economic diversification, underpinned by remarkable performance across strategic sectors, contributed to 72.2% of the total economic growth achieved in 2017. Thus, Dubai is ranked 8th in the world for ëDiversification of The Economy,í ahead of developed economies like Switzerland, Japan, France and the United Kingdom. Dubai has advanced service sectors today, each of which is a milestone for the economy in Dubai, including land, sea and marine transportation, warehousing, wholesale and retail trade, foreign trade, housing and foods. Dubai also has a manufacturing sector that keeps pace with the times and exports abroad, accounting for 9.4% of real GDP. This is due to the policies adopted by the UAE to promote growth of the national economy since its establishment in 1971. The monetary policy and the exchange rate regime adopted by the UAE Central Bank have been particularly effective in achieving economic stability and in enabling the local economy to keep pace with global economic changes. In its preparations for the future, Dubai established institutions such as the ëDubai Future Foundation,í which is working on future-focused initiatives. Last year, Dubai launched the ëDubai 10Xí initiative to apply what rest of the cities in the world will implement 10 years later. Dubai will also become the largest laboratory for future government experiences in the world, which will sustain Dubaiís competitiveness. Recently, Dubai launched the Dubai Blockchain Strategy, making Dubai government the first in the world to conduct all transactions through this future network, thereby achieving a quantum leap in the efficiency of government transactions and all economic sectors. Dubai accords top priority to innovation and seeks to turn into a global hub for innovation in varied areas of the economy, education and health, among others. Currently, Dubai is working on spreading the culture of excellence, creativity and innovation to be the philosophy that governs the work of national institutions by providing an atmosphere that encourages leadership and initiative at the regional and international levels in line with the Dubai 2021 Plan, which is dependent on various factors, including innovation to achieve sustainable development. Dubai seeks to change its course always to keep pace with globalization and the technology revolution taking place in the world. The approach in the Dubai 2021 Plan is to achieve total factor productivity growth within an economic diversification framework that goes beyond traditional business models to transform the emirate into a knowledge-based economy. ëDubai Competitiveness Report 2018í at a glance: The first of its kind in the region, the Report compares Dubai with 63 economies across the world based on 346 competitiveness indicators of the World Competitiveness Yearbook. The Report contains a scientific analysis of the competitiveness indicators in different sectors and their implications on policy development. It also provides reference frameworks for public and private sector decision-making in Dubai to formulate appropriate strategies to promote economic growth and consolidate the emirate's position on the global competitiveness map. ëEconomic Performanceí, one of the Reportís main Pillars, is a composite of various indicators, such as real GDP growth rate, GDP per capita, diversification, employment and unemployment rates, foreign trade (exports and imports), FDI inflow and outflow, resilience of the economy, and inflation.